Our School Garden! has a curriculum guide. You can find it under the Our School Garden! link at the top of this page (if you’re reading this on Facebook, go to rickswann.com first). It has suggested activities for elementary school students for all the poems in the book. 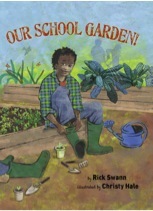 It also has suggested readings of other books, like Tops and Bottoms by Janet Stevens, that also support school garden lessons. Keep checking back to this site as I will continue to fine tune and add to it.